Since 2000, Camilla Cook has been committed to supporting the arts in Connecticut and New York. An Artist Consultant since 2007, Camilla has drawn on her arts administration experience to provide strategies that have empowered over 175 artists to advance their careers. 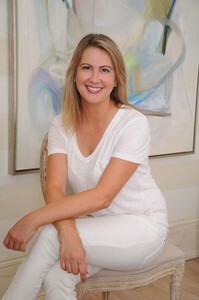 As an independent curator, Camilla has put together several well-received exhibitions including The Wall of Hope at Yale-New Haven Hospital, CT in 2012, The Art of Inspiration at the Time Warner Center, NYC in 2010; Fresh Pics: Contemporary Art in Connecticut at the Ridgefield Guild of Artists, CT in 2010; and Michael Manning: Everyday Hero at the UCONN Stamford Art Gallery, CT in 2009. In 2008, she was awarded a Neuberger Curatorial Fellowship and organized the exhibition Focus On: Calder's Circus, The Lithographs at The Neuberger Museum of Art, NY. Camilla currently serves as Associate Art Director for Sandra Morgan Interiors & SM Home in Greenwich, CT, where she has curated exhibitions including Terra/ Fiore/ Mare, Punch & Sizzle, and First Blush: The Joy of Beginnings. She implemented an online catalog to manage the several hundred artworks that rotate in and out of inventory; and re-designed the website to better feature the art and design projects, integrate Instagram posts, and make the general content more dynamic and user-friendly. She writes a weekly "Curator's Choice" blog, provides consulting services for prospective art buyers, and manages 20+ gallery artists, seeks new talent, and coordinates all marketing, PR and social media efforts. Prior to that she served as Education Associate at The Neuberger Museum of Art in Purchase, NY, where she planed all the academic and adult programs to compliment the Neuberger's ambitious exhibition program of modern and contemporary art. Noteworthy programs among the 25+ she produced include two site-specific performance pieces for Mexican artist Teresa Margolles, and an intensive Study Day to provide a focused look at the life and work of painter Louise Fishman. Camilla has moderated panels and lectured on art-related topics and juried regional art competitions throughout New York and Connecticut. In 2006, she was invited to serve on the Aldrich Contemporaries committee at The Aldrich Contemporary Art Museum, CT. She has helped the Westport Arts Center, CT to develop their Online Gallery and has cataloged the artwork of celebrated printmaker Antonio Frasconi. She has authored published essays, including "Pioneering the Genetic Revolution: Eduardo Kac and the GFP Bunny Project." From 2003-2007, Camilla served as Guild/Exhibitions Administrator at Silvermine Guild Arts Center in New Canaan, CT, where she was responsible for processing over 8,000 artist applications and exhibition proposals. Assisting in the production of over 100 exhibitions, Camilla coordinated marketing campaigns, designed and produced printed materials, guided artists through application procedures, liaised with jurors and arts professionals, oversaw delivery and installation of artwork, and arranged receptions, lectures, symposia, critiques and enrichment programs. In 2007, Camilla oversaw the launching of Silvermine's updated website, for which she exclusively crafted the Online Gallery and Guild pages, which continues to be an excellent resource for collectors, curators and educators. Camilla was a recipient of the Dr. Noel S. and Richard B. Frackman Scholarship and received a M.A. in Modern and Contemporary Art History, Theory and Criticism at Purchase College, NY in January 2009. She was a teaching assistant in the Purchase College Art History Department for Survey I (Ancient-Medieval), Survey II (Renaissance-21st Century) and Intro to Modern Art. Camilla received a B.A. in Art History from Boston University and has studied fine art and art history abroad at Rygaards Skole in Hellerup, Denmark (1995), Studio Arts Centers International (SACI) in Florence, Italy (2001) and Kunsthojskolen Thorstedlund in Frederikssund, Denmark (2002). Whether applying to exhibitions, crafting press releases, managing mailing lists or cataloging artwork, Camilla brings an insider's view to help artists achieve their professional goals.